New Delhi, June 5: Adding a feather to the existing victory hat, the women on World Environment day have been given a unique gift. 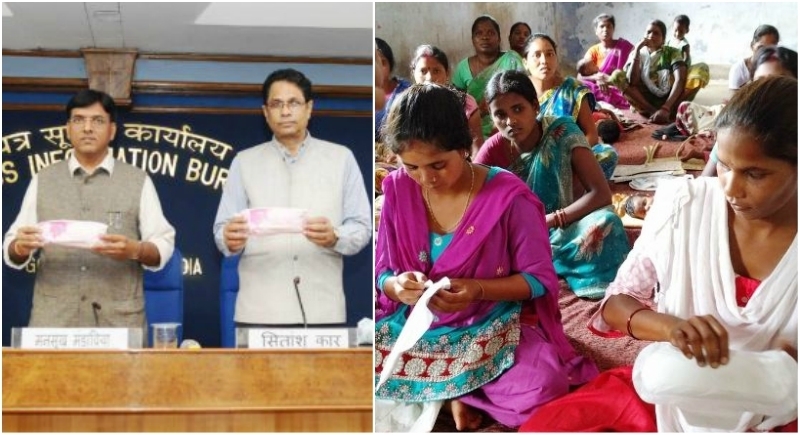 An Oxo- biodegradable Sanitary Napkin which has been launched by the Government under the ‘Janaushadhi Suvidha’, the affordable sanitary napkins will now become available at over 3,600 Janaushadhi Kendras functional in 33 States/UTs across India. Launched by Union Minister of State for Chemicals & Fertilizers, Road Transport & Highways, Shipping, Mansukh L. Mandaviya, this is a special gift for all women on the eve of World Environment Day, as this unique product would ensure affordability, hygiene as well as ease of use and disposal for them. Jan Aushadhi Suvidha comes with a special additive, which makes it biodegradable when it comes in contact with oxygen after being discarded. This would ensure ‘Swachhta, Swasthya and Suvidha’ for the underprivileged Women of India and go a long way in the achievement of Prime Minister Shri Narendra Modi’s vision of Affordable and Quality Healthcare for All. Emphasizing upon the affordability aspect of SUVIDHA, Mandaviya said that the average price of sanitary napkins available in the market today is around Rs. 8 per pad, whereas now with the launch of the SUVIDHA napkins at Rs. 2.50 per pad, this will go a long way in making the basic hygiene requirement aid for Women affordable for the underprivileged sections. Mandaviya noted that this is one of the most important requirements in ensuring the Health Security to that section of Women in India who still use unhygienic aids during the menstrual period due to non-affordability of some of the popular brands of sanitary napkins available in the market today. Such unhygienic aids cause fungal infections, Reproductive Tract Infection, Urinary Tract Infection, Cervical cancer and also make women vulnerable to infertility.